Even in the prosperous fishing town of Great Yarmouth, fishermen often fell on hard times. These almshouses were built in 1702 as a home for 'decayed' fishermen and continued to function as such until the late nineteenth century. The statue of Charity standing before the gate underlines the nature of the buildings. This is one of eight watercolours Mona Moore made of Norfolk scenes for the Recording Britain project. When they were exhibited at the National Gallery in 1942 in the exhibition 'The Queen's Pictures at the National Gallery', they were singled out for praise in the News Chronicle, whose reviewer wrote, 'Miss Mona Moore's East Anglian paintings have a lyric atmosphere that is almost a substitute for a holiday in Norwich'. 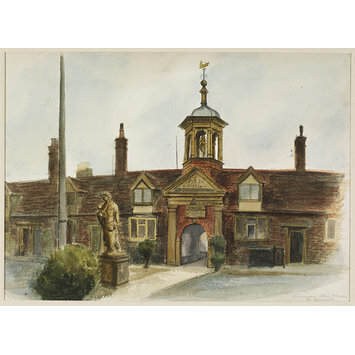 A watercolour drawing of red-brick early eighteenth-century almshouses, the entrance topped by a cupola with a ship weather vane. A statue of Charity stands before the entrance. 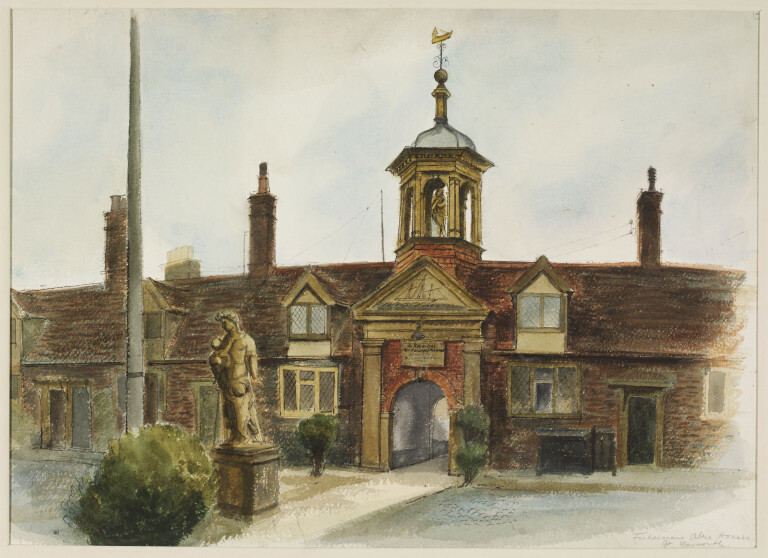 Historical significance: Mona Moore, a watercolourist and printmaker known for her illustrations, contributed eight watercolours of Norfolk scenes to the Recording Britain project. When they were exhibited at the National Gallery in 1942 in the exhibition 'The Queen's Pictures at the National Gallery', they were singled out for praise in the News Chronicle, whose reviewer wrote, 'Miss Mona Moore's East Anglian paintings have a lyric atmosphere that is almost a substitute for a holiday in Norwich'. The almshouses, known as the Fishermen's Hospital, were built in 1702 as a home for 'decayed' fishermen who had fallen on hard times. Palmer, Arnold, ed. Recording Britain. London: Oxford University Press, 1946-49. Vol 2: Essex, Suffolk, Cambridgeshire and Huntingdonshire, Northhamptonshire and Rutlandshire, Norfolk, Yorkshire. Introduction to Norfolk, p.145. Palmer, Arnold, ed. Recording Britain. London: Oxford University Press, 1946-49. Vol 2: Essex, Suffolk, Cambridgeshire and Huntingdonshire, Northhamptonshire and Rutlandshire, Norfolk, Yorkshire. pp.150-151, illus. Recording Britain, London, 1946-9. Volume 2, page 151.